Have you ever stopped to remember your life, pre-cancer? In one of the books I read how a cancer survivor described her life BC and AC (denoting it as ‘before and after cancer’ instead of ‘before and after Christ’). Still, it’s important to recall better times and to remember that you are more than this disease and will hopefully be in remission again. This is just one exhausting and challenging chapter of your life. In this video, I answered the question about how I met my husband and became passionate about writing and what life was like before cancer. If someone were to ask you about your earlier life, what might you remember? What are you passionate about doing? Are you doing that even more now? Are you leaving behind a legacy and enjoying your life? If someone made a short video of you discussing your pre-cancer life, what might you say? Perhaps you want to journal about it. Remembering good times past and going forward will remind you or your wholeness and your long life. there will be many more memories and you are the heroine in your story. Finding out your diagnosis is a very difficult because it’s the first time that you are hearing this news and you know that your life is going to radically change as a result. It’s great to have a loved one there with you in your doctor’s office to take notes. Your doctor may rattle off a lot of hard to hear facts so that person can take them in more accurately than you may be able to at that moment in time. Remember that you will have time to assimilate it all. You may get a second opinion and will be able to ask your doctor questions on further occasions, and you will have time to do your research. So, give yourself a little room to take it in gradually and to know that you will be able to gain support to cope with this news and its significance over time. 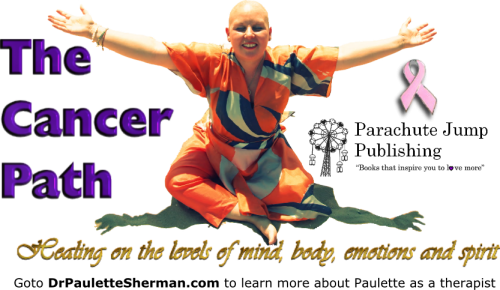 You will find a way to cope, get the best treatment and even learn spiritual lessons along the way on your cancer path. So, just breathe and give yourself some time to take it in. When your path suddenly changes, sometimes your actions need to change too. Finding out that you have cancer is enough to drive you towards the Ben & Jerry’s and make you want to hide under the covers but when you find out you have a life threatening illness, you often want to do everything you can to stay healthy and this involves changes on the level of mind, body, emotions and Spirit. Many people say that diet and lifestyle affects cancer and some do not. Most agree that being overweight increases the chances or recurrence and most researchers have found that sugar fuels cancer cells. So one thing I am trying to focus on is eliminating sugar and bakes products and carbs. I’ve mostly stopped drinking diet coke or alcohol (except on special occasions). I’m eating more vegetables, eliminated red meat and am having just a little chicken and fish. I drink almond milk and eat only a little organic cheese and cage free organic eggs. These were changes I probably needed anyway but cancer was the Zen stick I needed to take them more seriously. I walk the beach for exercise and will soon be adding more of an exercise routine. I was tired after radiation and chemotherapy. On the mental level, I try and meditate each day to clear my mind. I surround myself with positive spiritual teachers, read inspiring books and listen to great podcasts and audio books. I write to reflect upon my thoughts and notice when they are fear-based instead of love based and then try and make that shift back to love. On the emotional level, it is good to allow yourself to cry and be scared when you need to but it’s important to remain present and not to create stories about your cancer that have not happened yet. When you do this you create emotions based upon a future projection, and you have enough to cope with now. Love and passion are also high emotional vibrations so you can choose to remember your blessings, the people who love you and the things about which you are passionate in this life. Lastly, on a spiritual level, cancer often gets you in touch with your Higher Self or the eternal part of you that’s connected with the Divine. I meditated and prayed more and was aware of my angels and earth angels. I also connected with my soul’s purpose here, which (besides being a mom and therapist) was to write a legacy of books. I am describing a few of the things I shifted in each category so that you can begin to think about what changes you’d like to make. There is no easy answer about how to tell young kids that you have cancer, or at least how to explain your hospital visits and bald head. This video answers the question about how we did this but you can consult a therapist or check out these websites below for more information. I think it’s important to know your individual child, what they need, how they will cope best and to consider what information is age appropriate. Cancer is hard for adults to understand and cope with. You want to be honest with your child while being protective. You can assure them that you have great doctors and you will do everything you can to heal this boo-boo. A woman’s hair is one of her biggest assets of femininity but you can still feel beautiful and feminine, even bald. Here are some tips to get you through losing your hair. 1- Feel your feelings. Let yourself feel sad or angry about losing your hair. 2-Consider cutting your hair short first so it won’t be as drastic when it starts falling out. 3- Prepare yourself by buying a wig and some pretty hats and scarves. 4-When your hair falls out in clumps, just shave it all off. 5- Buy some pretty electric blue liquid eyeliner to line your eyes and some pretty lipstick so you feel like a goddess. 6-Get a henna crown so you feel the ancient feminine upon you. You can get a spiritually significant design like I did. 7- Remember your real beauty shines from the inside-out and your hair will grow back again. It may even be thicker. You can also buy a cheap fun wig to make you and others laugh. Get one in blue, green or pink. In New York City, you can get a cheap fun wig at a store called Ricky’s. If you are somewhere you can’t pick it up easily, you can order one online. Henna crowns are a great new option for women who lose their hair from chemo. I heard about this through an organization called www.hennaheals.org. They referred me to a henna artist in NYC called Kenzi. She came to my house (and commuted 90 minutes). She created my henna crown in 2 hours for just $100, which to me was worth it. It was a gift to myself and you can do it too. Kenzi, my henna designer can do henna crowns or henna on your arms. Her website is: www.kenzi.com. Many henna artists do Indian or Moroccan henna designs. I wanted a labyrinth with a heart in the middle of my head with some butterflies and flowers, representing growth, transformation and the spiritual cancer path. So you can create your own design or use traditional symbols. This type of art will last two weeks but you can take pictures and you will remember it as a transformative part of your cancer experience. 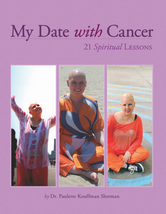 Sometimes cancer can lead you down a spiritual path to help you discover your soul’s purpose and what is most important to you. For me this meant connecting to my Higher self and wanting to give back by leaving my messages behind in the form of books. 1- I learned to better balance and be aware of the different parts of myself. 5- I tried to look at my karma and how I could love more. 7- I learned that our bodies are our Temple but we are Spirits in physical bodies. Take a moment once you are at least a third-way through your cancer path to reflect upon the spiritual lessons that you’ve learned. We may not be able to control whether cancer returns or when illness can strike but in the new year we can all work on doing our best to improve our health habits. This is an ongoing project for me. Since being diagnosed with breast cancer almost a year ago, I have worked to improve my diet, decrease my stress level, improve overall life balance and increase sleep. It seemed like a lot of changes at once and often it was two steps forward and one step back. This is the way with most change once habits have become ingrained. 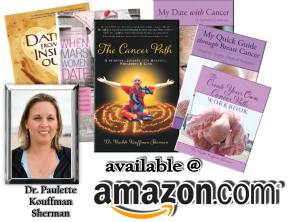 In my upcoming book ‘The Cancer Path’ (and in this video briefly) I describe the changes I tried to make. I also discuss the research on whether diet, exercise, stress levels, sleep and other health changes may affect cancer cells. Ironically, sometimes it’s only during a health crisis that we finally improve our health! For those of you who are not in the throes of illness, maybe you will start now. I wish you great health and lots of love and support with your efforts! P.S. Two books that my patients recommended about change are ‘Mindset’ and ‘Shift.’ I have them but haven’t read them yet. I’ve been too busy writing!